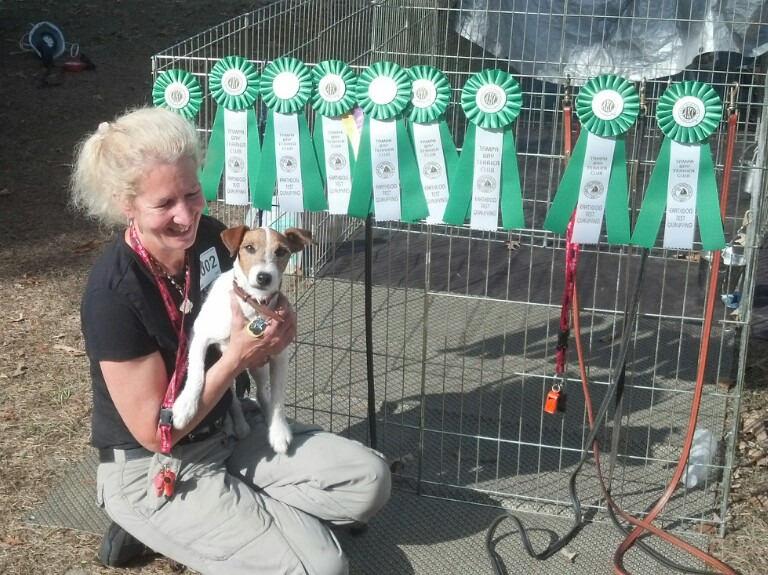 An Earthdog trial tests the working ability and instinct of the small, short legged terriers. These dogs were bred to hunt vermin and other quarry which lived in underground dens. 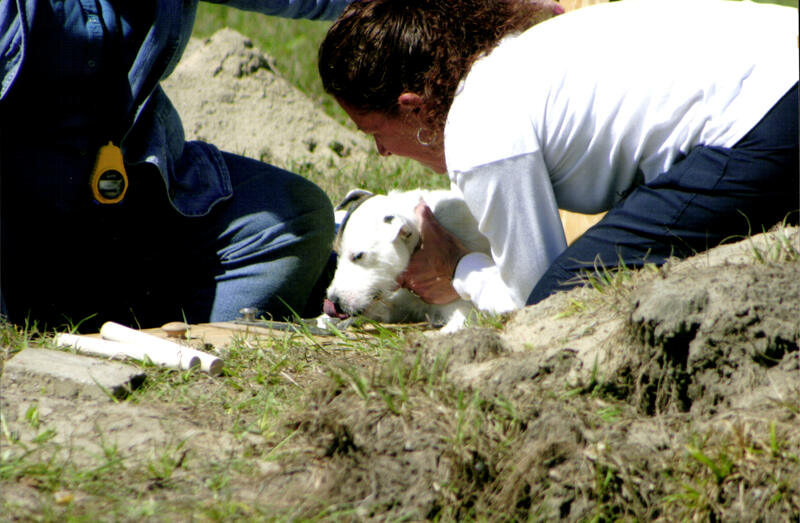 Earthdog den trials involve man-made underground tunnels that the dogs must negotiate, while scenting a rat, the "quarry." The dog must follow the scent to the quarry and then "work" the quarry. Depending on the sanctioning organization, “working” means barking, scratching, staring, pawing, digging; any active behavior. The quarry is protected at all times by wooden bars across the end of the tunnel. The hunting encounter is controlled, and neither dog nor the quarry, usually two rats, are in any danger. Object of the test is to reach the quarry at the end of the tunnel. 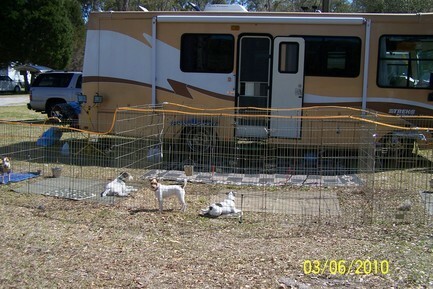 The quarry are well protected so the dogs can not get to them behind bars. The dog is to "work" the quarry. There are now four levels, with the Earthdog Endurance just being added in the ACK venue. The dog has to complete each level before moving onto the next. All this is judged in a timed situation. The levels of Earthdog to compete in are Introduction to Quarry, Junior Earthdog(JE), Senior Earthdog(SE), Master Earthdog (ME) & Earthdog Excellent (EE). 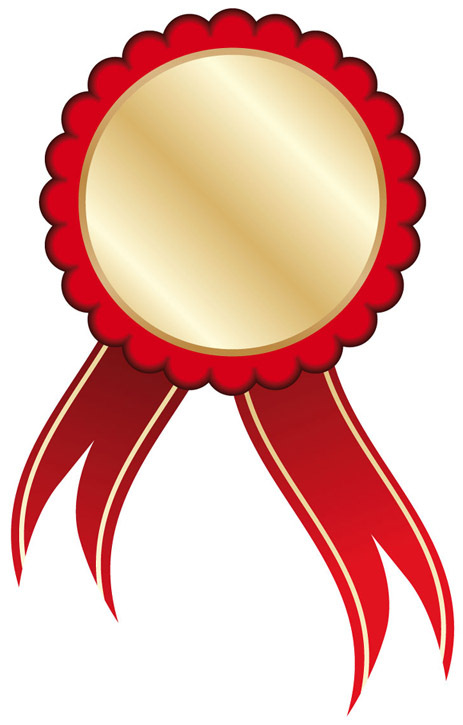 At the JE level your dog must successfully pass two Junior tests, judged by two different judges to receive the JE title. The SE level is a little trickier, the dog and the handler must work as a team, passing this test three times will afford the dog their Senior title. The ME level is a true test of hunting with a brace partner, passing this test four times your dog will gain the Master title. 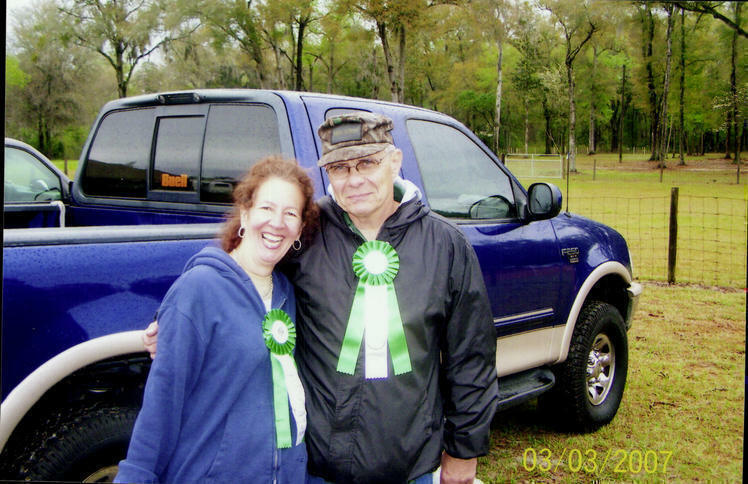 The EE level is for the dog & handler who does not want to be left out of the game, once they receive the ME title. To gain an EE title, you will enter your dog in SE & ME, and you must pass them both. Do this five times and you will have the coveted EE title. What Fun!!! 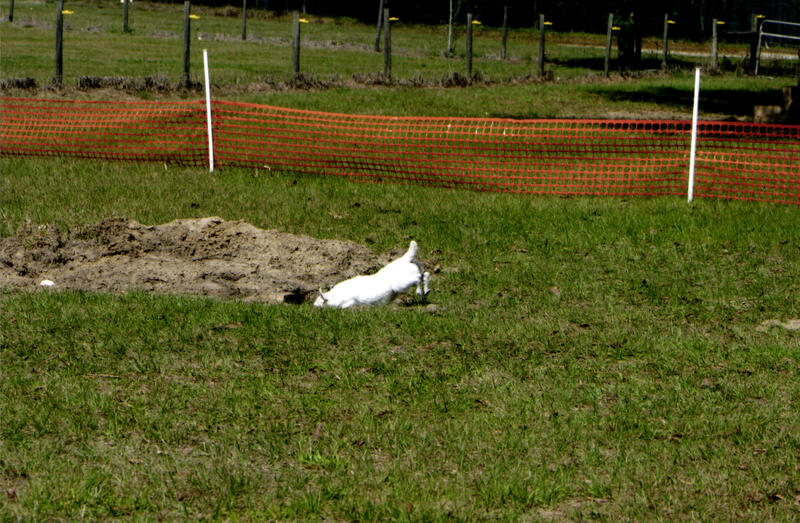 An earthdog trial tests the working ability and instinct of the small terrier or Daschshunds. These dogs were bred to hunt vermin and other quarry which live in underground dens. Earthdog den trials involve man-madeunderground tunnels that the dog must negotiate, while scenting a rat, "the quarry". The dog must follow the scent to the quarry and then "work" the quarry. According to AKC "working" is defined as barking, biting, digging, scratching; any active behavior. The quarry is poitected at all times, in a cage behind wooden bars/dowels at the end of the tunnel. The hunting encounter is controlled, and neither the dog nor the quarry (usually 2 rats) are endangered by the activity. 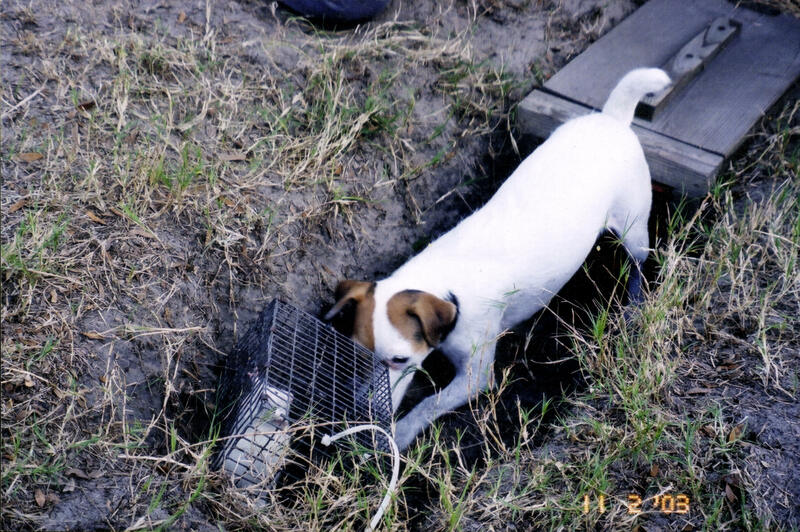 AKC earthdog tests are intended as noncomprtitive venues in which the handlers may gauge their dog's natural hunting aptitude when presented with an underground hunting situation. 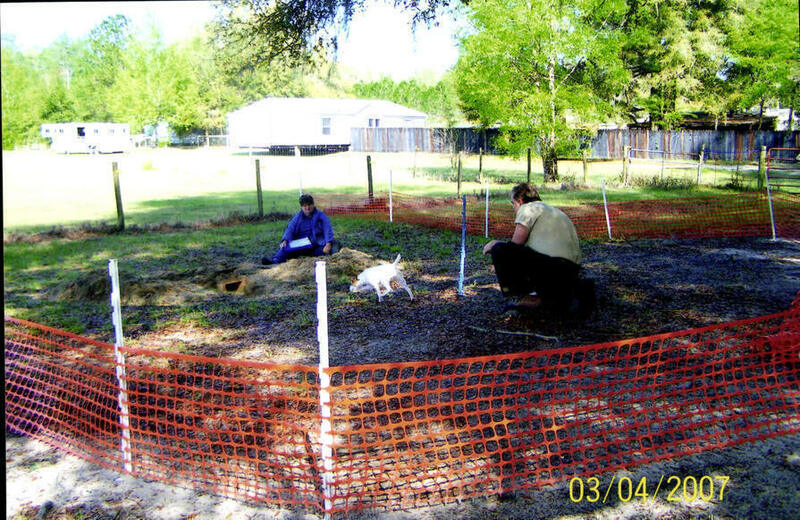 According to the AKC General Regualtions for Earthdog Tests, the noncompetitive program begins with a basic introduction to den work and quarry, progressing through gradual steps to the point where the dog can demonstrate willingness to work in the field off lead with it's brace partner, perfrom required tasks, including seeking it's quarry, working underground and being under the control of the handler at all times. 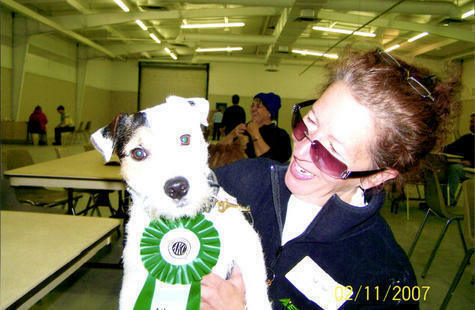 Dogs that have never competed at an earthdog trial will need to be introduced to the quarry. Dogs have different levels of prey drive and some need more encourement that others. 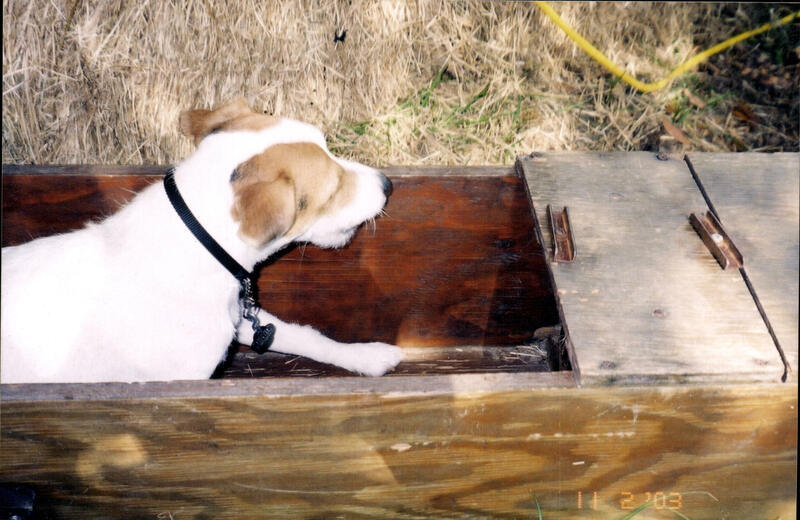 The Introduction to Quarry is simply designed to aquaint the dog with "going to ground", following a scent trail and "working a rat". At this stage, the dog is asked to negotiate a 10 foot tunnel with a single right-angle turn. 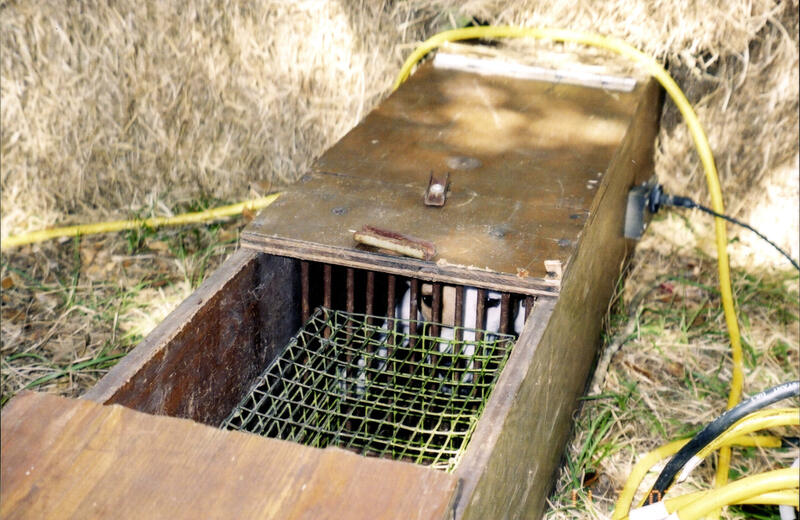 At the end of the tunnel is a rat in a cage, which is placed behind the wooden dowels. The handler may talk to their dog and encourage the dog to "work" the rat. 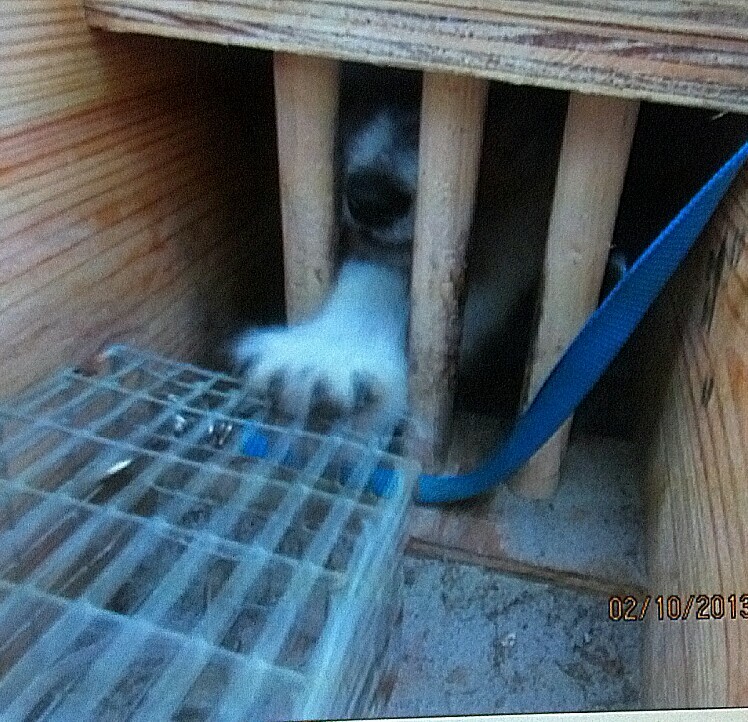 The judge may also move the rat cage about or make noises to "incite the dog's instincts". Junior Earthdog (JE) is the first level of competition in which a title may be earned. In JE the tunnel is 30 feet long and has 3 right-angle turns. The dog has only 30 seconds to traverse the tunnel and reach the quarry. The dog must also work the quarry for 60 seconds and then allow the handler to remove it when the time has elapsed. 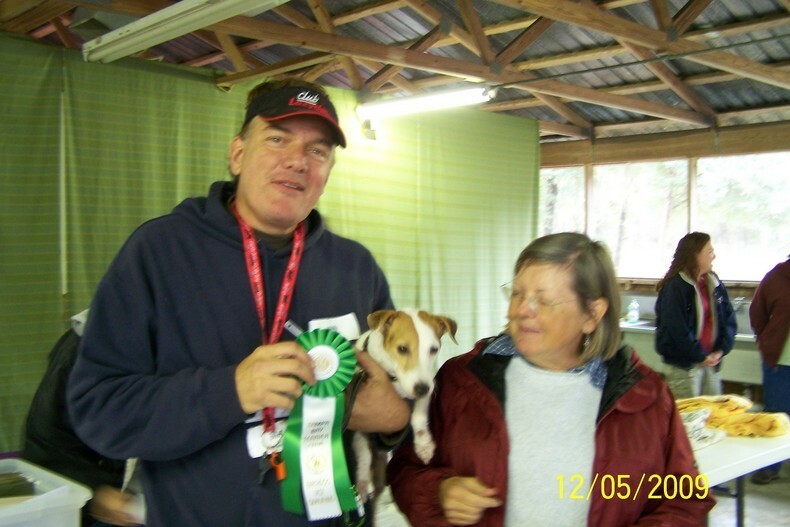 To earn a JE certificate, the dog must successfully pass the JE test twice under two different judges. 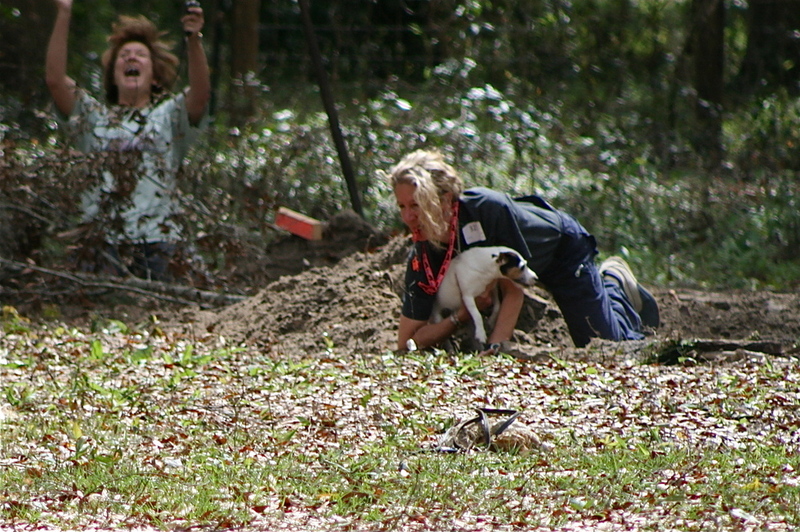 To earn a Senior Earthdog (SE) title, the dog must receive three qualifying scores from 2 different judges, achieved by accomplishing the following: follow a 20-foot-long scent line to a tunnel entrance that the dog cannot see from ground level; track through a pitch black 30 foot tunnel containing three 90 degree turns to the rats; not be distracted by a false entrance/exit arrangement; not be distracted by a dead end tunnel that is scented with rat bedding; once at the rats, work the rats for 90 seconds; after working the rats, and after the rats are removed from the tunnel, leave the tunnel when called by the handler and return to the handler within 90 seconds. Master Earthdog is the most difficult title that an earthdog can earn. To achieve this title, two dogs are drawn at random. As a brace, the dogs hunt together for the tunnel entrance from a distance of 100 to 300 yards. They must actively indicated where the tunnel entrance is located. Then, the first dog to mark the quarry, will be able to work the tunnel/quarry. The dog will move through the tunnel passing obstacles that simulate roots and constrictions. The master tunnel also has a false entrance/exit and a false den. Once at the quarry, the dog must work the rats for 90 seconds and not be distracted by the judge scraping or digging alongside the tunnel. The scraping is meant simulate the hunter digging down to the spot where the dog is holding the quarry at bay. 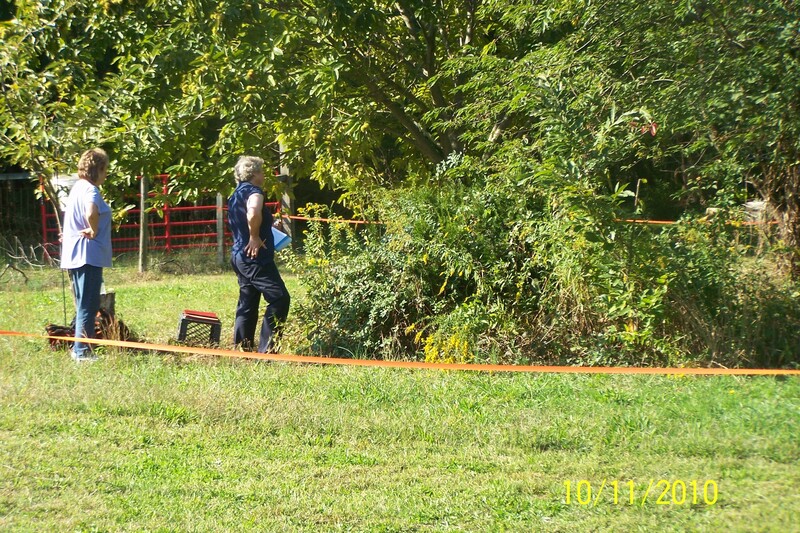 The handler has 15 seconds (not very long, Ecko) to remove the dog from the tunnel after their 90 seconds of work is complete. Each dog is also judged on how well they "honor". While the one dog is in the tunnel working, the other dog is staked out near the tunnel entrance. The "honor" dog must show interest but must not make so much noise that the judge cannot hear the dog at work in the tunnel. Four passes under three different judges is required for a Master Earthdog title. 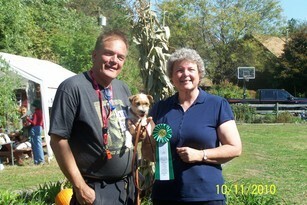 The first new earthdog title since the program's inception in 1993 was announced on November 30,2009. Five double qualifications in Master and Senior are the basis of the new title and the effective date was March 1, 2010. Not an easy feat!